In the Vegan Pepperoni Pizza recipe I show you how to make the world’s most favorite pizza in a vegan version. 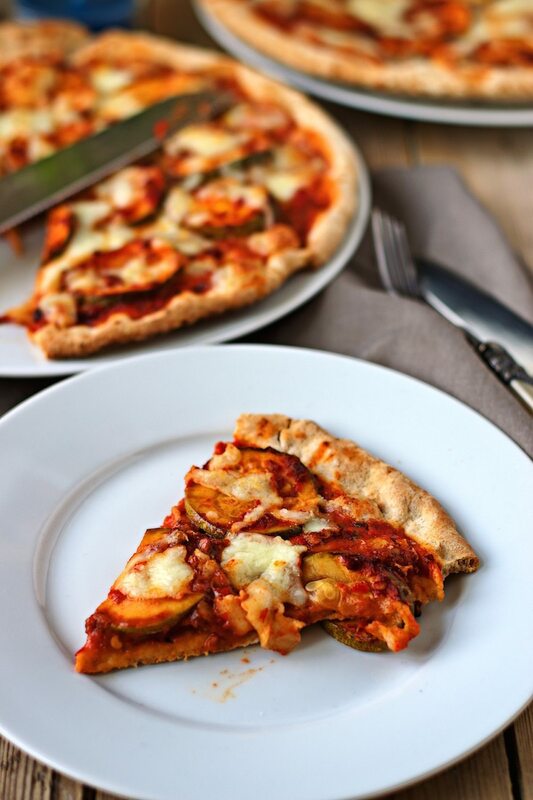 The key is making thin, fiery spiced zucchini slices as a vegan pepperoni alternative – let’s calls them zucchinoni and enjoy a delicious pizza together. In last weekend’s Burger vs. Pizza poll on Facebook (deciding which would be the recipe posted on Monday), the Vegan Buffalo Burger narrowly came out on top. But there is no need to be disappointed for the pizza lovers because here is already the runner-up: my Vegan Pepperoni Pizza. Pepperoni Pizza seems to be consistently near the top of lists with favorite comfort foods. And it’s understandable – take a crust, throw pepperoni and cheese on top, bake, done. So simple. However what can you do when you want it meatless and dairy-free? Having a good vegan cheese is one thing. The other is how to capture the pepperoni style? Of course one can go and try to find some ready-made vegan sausage, slice it and be done. Fair enough, but that’s not what I wanted to do here. Instead I was looking for a homemade plant-based option. I found it in using thin zucchini slices that I marinated overnight in a spicy hot sauce mix. I used, for example, sambal ulek – a raw chili paste – and a bit of tamari, and balsamic vinegar. It depends a bit on just how spicy you like your zucchini-“Pepperoni” (or “zucchironi”?!?) In fact, I also put the mix in the oven at medium temperature for a couple of minutes before I stored the zucchini-“Pepperoni” in the fridge – but I’m sure this is not essential. Just keeping it marinated will do. What you get is not only fiery spiced (or no so much depending on your preference) but absolute delicious. You know what you get when you do it all from scratch. And who knew it could be so easy? That’s right. Honestly, people, we need to do something good for us. No need to pump your body with artificial flavors when you can do so much better. And look at the pizza! Isn’t it stunningly beautiful? Don’t you want to grab a piece out of your screen? I know I do every time I look back at this Vegan Pepperoni Pizza. So who is in? Count of hands! Preparing the pizza is then – again – straightforward. I like to use a simple dough for the crust, combining gluten-free flour, water, baking powder, a pinch of salt, and olive oil. 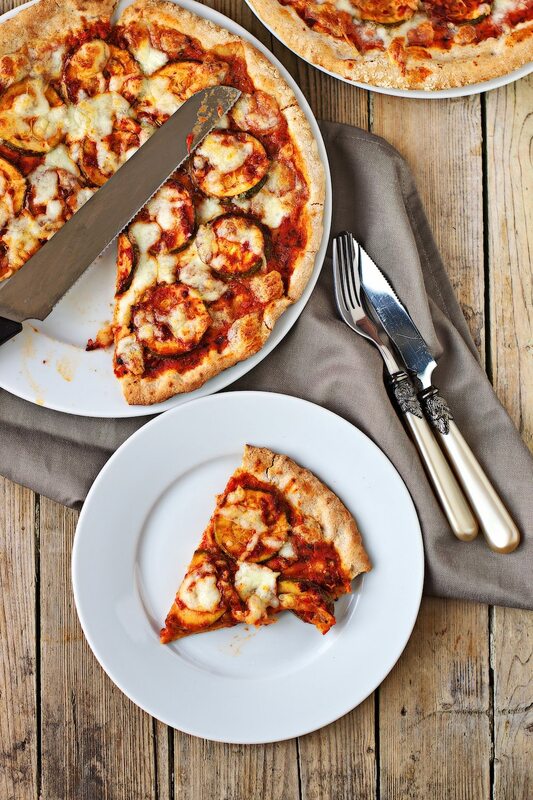 Spread a bit of tomato paste on top before you cover it with the marinated zucchini-“Pepperoni” slices. If you are really brave (or crazy), you can use some of the spicy marinade and mix it with the tomato paste for an extra spice punch. Finish off with the vegan cheese and bake for 12-15 minutes in the oven. What you get is a fierce Vegan Pepperoni Pizza unlike any you ever had before. As always if you try it. tag me on Facebook and Instagram. Say hello, snap a picture, and let’s meet up. Happy pizza night, Florian. Pepperoni Pizza seems to be consistently near the top of lists with favorite comfort foods. And it’s understandable – take a crust, throw pepperoni and cheese on top, bake, done. So simple. However what can you do when you want it meatless and dairy-free? Having a good vegan cheese is one thing. The other is how to capture the pepperoni style? In a baking dish, mix hot sauce with tamari and balsamic vinegar. Add the zucchini and mix, so that they are covered well. Cover and marinate over night in the fridge. Pro-tip: Put the spiced zucchini in the oven and bake at medium heat (320°F/160°C) for 10-15 minutes before storing in the fridge. Give all ingredients for the dough to a bowl and knead well. You should have a slightly moist but sticky dough. Let it sit for a couple of minutes. Form the pizza crust by spreading the dough. Spread the tomato paste on top of the crust. Add the marinated spicy zucchini slices. Top off with vegan cheese. You can of course use as much as you like. I want this NOW!!! I love how easy the crust is! What flour did you use specifically? Just an all-purpose GF? This looks absolutely TO.DIE.FOR!! What a genius idea using zucchini for the pepperoni!! Brilliant! I actually don’t have a great vegan cheese…now it definitely is on my search radar! This pizza is phenominal! This looks amazing! What vegan cheese do you use? Hi Autumn! I used a vegan cheese from a local store! Feel free to use your favorite! This looks absolutely amazing Florian and such a wonderful, creative idea (like always!) to use zucchini as the pepperoni! I have made pizza many times with zucchini, but never in my life would have thought to marinate it as pepperoni! You are so stinkin creative! This is stunning in it’s presence and simplicity! I’m loving all that cheesy goodness on top too! I agree with the top comfort foods too, my favorite pizza growing up was just cheese, pepperoni and black olives! This looks soo much healthier, but just as yummy! I smile at some of the vegan substitutes. Don’t tell your guests. They will never know. Every time I visit your blog you introduce me to new awesome food combinations. 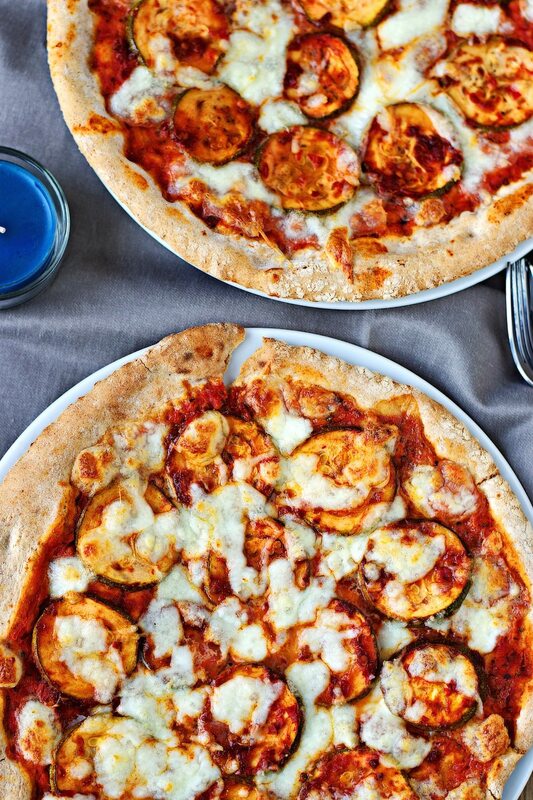 Zucchini on pizza?! So much yes! Incredible! I love this pizza. Zucchini on all the things right now! Interesting. I’ve tried those pre-made vegan pepperonis, but I can’t get into them. They just taste off. And, I really can’t get my husband to eat them at all! I must try this. It sounds great and like it would work really well. Thanks! Yeah, those things do taste off, don’t they? I can understand that people don’t like them. These ones are much, much better! This is so creative, love the pepperoni flavored zucchini! I can’t wait to try this! I’m always looking for fun new recipes! The recipe sounds so good and your pictures are absolutely amazing! 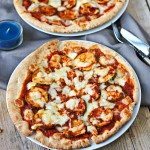 Love pizza and can’t wait to try your recipe! What a delicious idea! I have to try this recipe now. I am a huge fan of having zucchini on pizza. Not many people do that, so, I am glad you are highlighting it in this recipe. Glad you like it so much! Thank you, Rini! Yes! Cut me off a slice of this, please 🙂 I love all the things we can do with zucchini! 😉 will happily do, Sarah! Spicy zucchini slices are such a clever pepperoni substitute! I’ll have to try that next time I make a pizza! I used a brand of vegan cheese we have here in the Netherlands. From my previous visits abroad, I found that “Follow your heart” has similar results, if you haven’t tried that already. so interesting! i saw a picture and was like “that looks like zucchini…!” and was curious, so i was right 😉 i’m going to have to try this on my dad! love the idea!! Awesome! Let me know how it turns out, can’t wait for your feedback! Can you use plain flour instead of gluten free flour? Hi Meghan! You can use plain flour for sure! It’s got no yeast either, sigh of relief. Thank you so much, my favourite bloggers are people like you, good food, safe and uncomplicated recipes to guarantee success. How many ‘hot sauce’ do you need for the zucchini pepperoni? Hi Wendy! You will need 1/3 cup hot sauce! This looks so good! I am excited to try it! 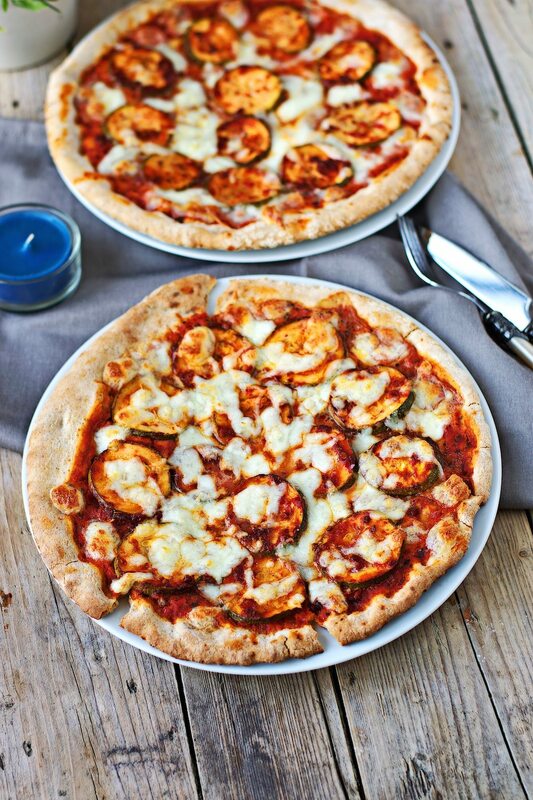 I want to make this for my family to prove to them we can still have pizza night AND be healthy! Can you give me some guidance on the hot sauce? Is this like Tabasco or more like Frank’s Red Hot… or something else? Hi Danielle! I would say it’s like Frank’s Red hot! pepperoni out of zucchini!? brilliant! Hi, Florian great Idea for this pizza I have been wanted pizza for quite some time now. I wanted to make this tonight for dinner. How do you think it will taste if I don’t have time to marinate over night? Hi Latasha! That’s not a big deal! Please allow them to marinate for around 15 minutes. Oh I’m super excited to try your “Zucchinioni”!!! What a great invention! Thanks for the vegan recipes! Thanks, Brenda! So easy and delicious! Let me know what you think!